The early morning mist cleared to leave a glorious day for the inaugural Clash of the Clans football tournament. With bragging rights & family pride at stake the competitive juices were flowing in the days leading up to the event, with all sorts of rumours of who was to fill the 'ringers' position in each clan team. Declan O’Sullivan & ‘Geezer’ did not appear… However plenty of notable ringers did show, to add to the flavour & prestige of the event! Proceedings got under way with a set of round-robin fixtures each team playing the other 4 teams in their group. The first major scalp of the day came as Courtney’s shaded McKeever’s by a goal. With Paddy McKeever & Oisin Mac Iomhair providing a considerable scoring threat, there was a strong feeling that these two sides would meet again before the end of the day! Courtney’s progressed to the Semi’s unbeaten, with ‘ringer’ current Antrim & St Galls attacker Kevin McGourty excelling. The McNeice / Kerr clan competed well in Group A, with a youthful team featuring Tir Na nOg’s Paul Carville, finishing in 3rd place and defeating both Keegan’s & Morgan’s along the way. Morgan’s & Keegan’s collided in the final game of Group A, a face-off for the wooden spoon. Despite Chris Murray’s trusty left boot & Kevin Keegan’s attacking threat, accompanied with some questionable umpiring earlier in the day from Big Pete concerning two, uncharacteristic, points from son Tony – Morgan’s prevailed with Malachy McLernon & Gerard Morgan the main scoring threats, ably assisted by the Marley girls Caoimhe (Morgan) & Sarah. In Group B, McCann’s, featuring Armagh & Clan na Gael legend Diarmuid Marsden, also took a big early scalp defeating the McGrane outfit featuring several ‘big hitters’ & including Current Armagh & Wolfe Tones defender Finnian Moriarty. McCann’s would go on to qualify for the semi’s unbeaten, With Jarlath ‘Jaffa’ McCann’s eye for a score impressing, along the way. The amalgamated Murphy / McCormack clan would also progress to the semi’s at the expense of the McGrane’s, by a single point in score difference, which led to much debate, in particular from adopted McGrane & current youth officer Paul Doherty, as to the heritage of some umpires!! A “partial tear of rotator cuff” & a broken finger were reported injuries from the McGrane outfit. A fancied Hughes’ team featuring Armagh & Keady Dual player Eugene ‘Nudie’ Hughes failed to deliver, even after future Hughes, Moy Tir na nOg’s Niall Kelly’s late arrival to bolster the team. Mark Hughes had the excuses ready, after complaining of being let down by “Our two best players”!! 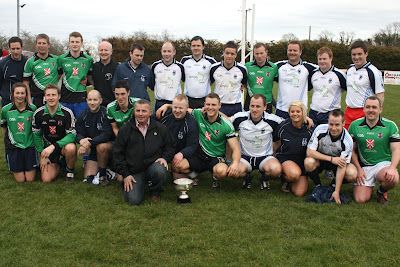 A youthful looking Lurgancott co – op took the wooden spoon in Group B. The team were full of running & gave the group winning McCann clan a tough outing, but were bullied off the ball by the more experienced heads in this section. With the top two teams in each group progressing, the semi finals were decided. McKeever’s defeated McCann’s & Courtney / McQuades defeated the amalgamated Murphy / McCormack clan to set up an intriguing final - & confirming Mark McKeever’s earlier forewarning “We’ll see you in the final!” following the group stage match between the same two teams. A cagey final ensued, with both teams exchanging points, & reluctant to take a chance, until Jack Wilson plundered a goal, in off the post, to put the Courtney clan in front & allow the experienced Kevin McGourty to call a possession game plan effectively killing the game. Best for McKeever’s was Oisin Mac Iomhair, top scoring for his clan. Paddy McKeever also made a telling contribution, whilst Mickey McKeever performed heroics throughout the day in nets - saving countless shots including a Diarmuid Marsden pile driver with his face! For the Courtney / McQuade’s Kevin McGourty was outstanding all day, & played every minute of every match. He was ably assisted by team captain Mel Courtney & half fit Paul Courtney, who received running repairs from uncle, (physio) Martin McQuade – possibly the key member of the winning clan! There was also telling contributions from Jack Wilson, John Vernon and the 3 Annaghmore McQuades. Congratulations to the Courtney / McQuade clan, deserving winners of a fantastic day in Ballyhegan. Discussions have already taken place on retaining the title next year!! Big thanks to the organizers (Tony Keegan, Gareth McCann, Dermot Hughes & Seamus McCann) & all those who participated, especially those 'ringers'!! Thanks also to Jimmy McKee, Kieran McKeever, Peter McKeever & Paul Johnson for the unenviable task of officiating the very competitive tournament! Finally thanks to all the sponsors of the event, including Barry Knox & Charlie Mallon for donating the meat for the BBQ.